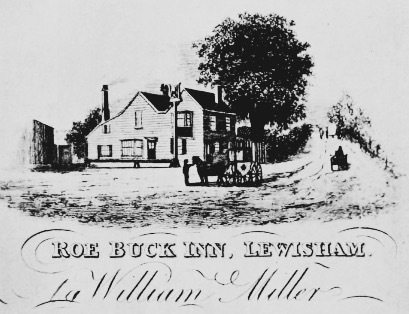 The Roebuck was a Lewisham pub that dated back until at least the 1740s, possibly earlier. In recent times its address was in Rennell Street but originally it was located on the High Street next to one of the two arms of the Quaggy as it joined the Ravensbourne. The other ‘arm’ had a pub too, the Plough, which Running Past covered a while ago. The two arms of the Quaggy were obvious in early Ordnance Survey maps, the Roebuck is the realtively large building just north of Rennell Street. 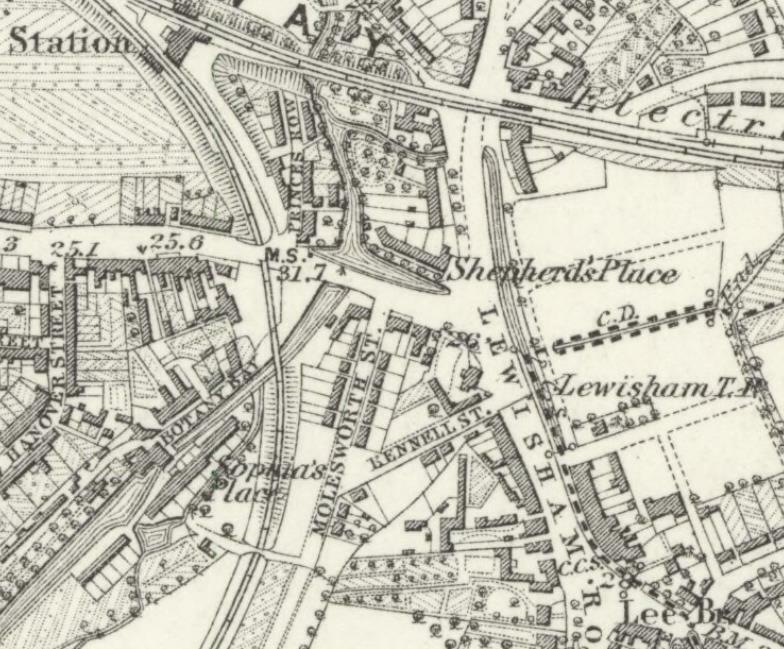 It was almost opposite the Lewisham Tollgate – marked ‘Lewisham TH.’ (Image on a Creative Commons from the National Library of Scotland). The first mention of the pub was in parish registers in 1742 (2) It was originally at 40-42 the High Street and it seems to have had a garden or bowling green at the side of it – which was later built upon. The garden had a chestnut tree, in the picture below, which was said to have been planted in 1683 (3). The William Miller referred in the picture of the pub, was the landlord from around 1834, the previous landlord was a William Lance – he decided to return to his former trade as a hatmaker (4). Miller was probably from Lewisham (his sister certainly was), he died in 1849, but his wife, Elizabeth, took over the tenancy – the owners were Roach and Hill (5) – helped by his son Robert, who was also listed as a licensed victualler in the 1851 census. Elizabeth Hall was from Westerham in Kent, although had lived in Lewisham since 1825, possibly earlier, as Robert was born there. The rate book listed the pub as having assembly rooms, garden, yard, stables and building land (4). Elizabeth was to remain the publican until around 1863 (6). In the 1851 census there were two relatives living at the Roebuck, one working as a barmaid, along with three servants and two paying lodgers. Robert had moved on by 1861 but a daughter Eliza had returned to work at the pub along with her husband, George Beven who was running the stables at the Roebuck. After the Millers left there was a steady trickle of licensees; in 1871 the landlord was Richard Wooff who was 40 – he lived there with his wife Hannah and 4 children and a neice – there were three live-in servants helping to run the Roebuck. He seems to have later moved on to the Three Tuns in Blackheath (now O’Neill’s) with one of his sons. At the 1881 census James Tyrell from Rainham was the ‘Licensed Victualler’, also living there was his wife Frances, three children and three servants. 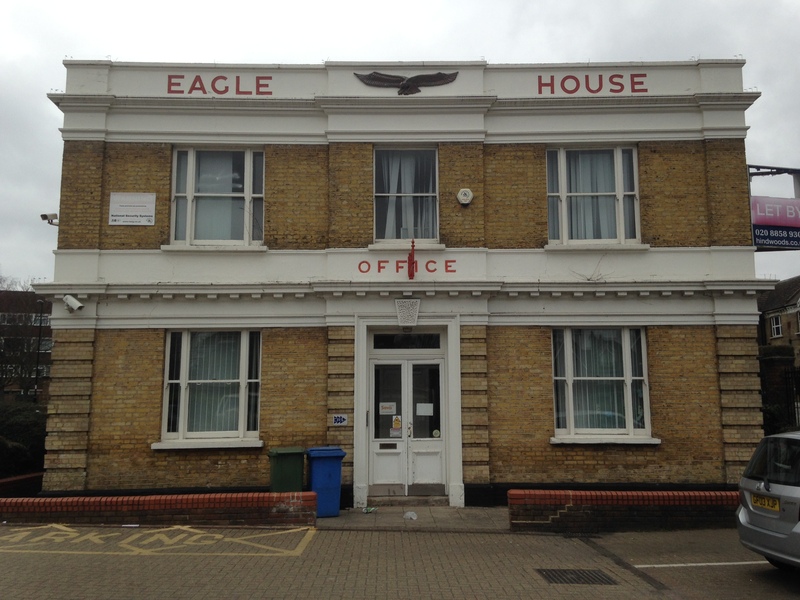 The beer around this time was supplied by the Nicholls brothers from the Anchor Brewery in Lewisham, which was covered by Running Past a while ago, whose offices (below) still remain in Tesco’s car park. A decade later, Samuel and Elizabeth Fryatt were running the Roebuck (or Roe Back as it is incorrectly transcribed in the census…). The Fryatts had six live-in staff including one with the wonderfully named role of Potman and Billiard Marker. 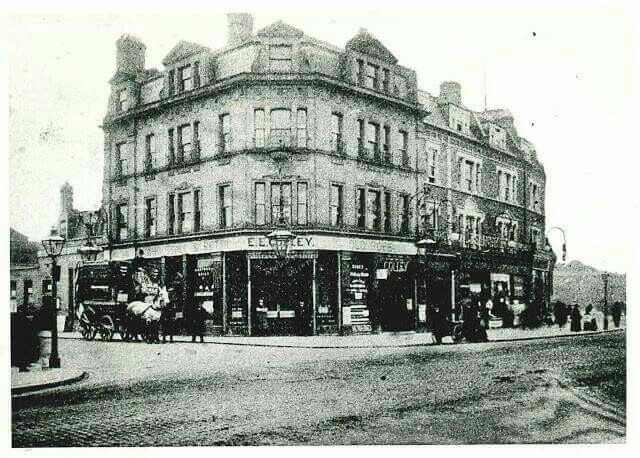 Around this time the pub moved to the corner of Rennell Street, its former site was later to become the Gaumont (picture below from postcard – eBay Nov 2016). The new building didn’t stop the steady flow of publicans though, Owen Ward from Ireland was there in 1901, when the census enumerator called, but had moved on by 1905, to be replaced by EE Coley. Charles and Beatrice Freeman had arrived by 1911, he from Brighton, she from Portsmouth. The business was creating enough trade to support three live-in barmaids, two cooks and a domestic nurse – presumably to look after the Freemans’ children. The Freemans certainly lasted longer than many of their predecessors; they were still there in 1921 Post Office Directory. Leonard Jennings was the landlord by 1938 and in the 1939 Register; he was a Bermondsey boy, born in 1877 – he married Sarah Elizabeth in 1906 in Southwark. They had moved on by the end of World War Two, Leonard passing away in Greenwich in 1947. One of the next landlords (1956) was W H J Harris. The pub moved again, probably in the late 1950s or early 1960s, from its impressive position on the corner of the High Street and Rennell Street to a position a little further back down Rennell Street. There are a couple of photos courtesy of Boak and Bailey’s Beer Blog – one each of its exterior and interior from 1961. 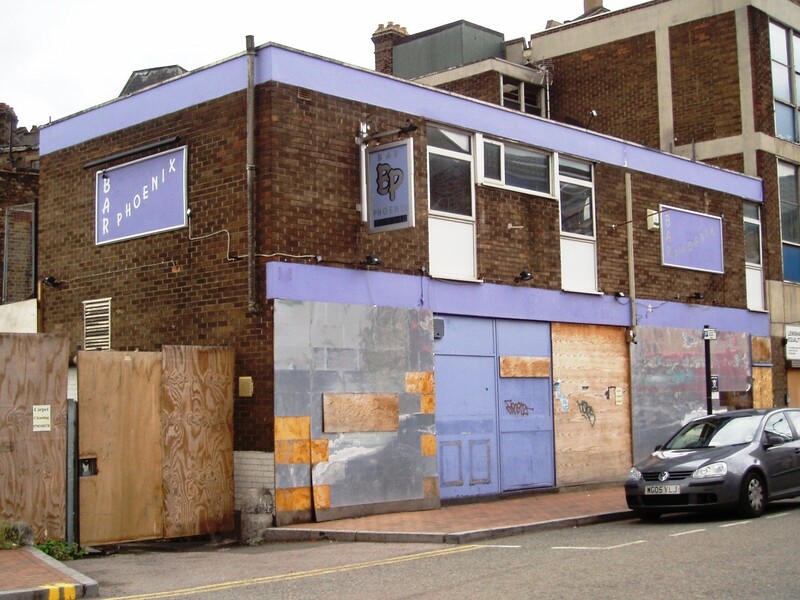 It had a function room (downstairs) where bands played – those performing there included the local ‘legend’ Albert Lee, who grew up in Kidbrooke Park Road in Blackheath – according to several comments on Facebook threads relating to this post he was a regular performer there. It also nearly saw the demise of Dave from Chas ‘n’ Dave who was non-fatally electrocuted on stage there whilst playing with The Tumbleweeds. Other famous names spotted there included Lee Brilleaux from the Feelgoods, alas this wasn’t as a performer, but to buy some cigarettes before a gig at the Gaumont around the corner. During the 1970s the Roebuck also became a relatively well-known Country & Western venue on Tuesday nights, hosting bands in the basement. A Facebook thread from a while ago fondly recalled a local singing postman who was renowned for his rendition of Charley Pride’s ‘The Crystal Chandelier.’ Around the same era a Shadows tribute band called Apache who played regularly at the venue. Other Facebook reminiscences from this post included Saturday nights which frequently saw tribute acts in the basement including Jim Reeves, Roy Orbison and the Everley Brothers. After the bar closed, some went to the Gaumont on the pub’s former site for late night ‘pictures’. Kicking out from there would be after the last bus – so it would be a long walk home. Harry Robinson was landlord during the 1980s and also owned Lewisham firm Robinson’s Hauliers based in Thurston Road. My own recollections are from a decade later – my memory is of a dark, dismal place with little natural light and a blurry fag smoke fug even when there were few drinkers lighting-up. The Roebuck, near Lewisham Shopping Centre, is dire, but has to be seen to be believed. It attracts a strange mix of ‘fresh’ and ‘experienced’ faces. This gay-friendly bar is a real find. I’d heard good things about The Roebuck from friends so last Saturday we trooped off to the place anticipating a good night. We simply had a ball. The service was outstanding and the atmosphere unrivalled by any bars in the area. The Roebuck has got to be seen to be believed! 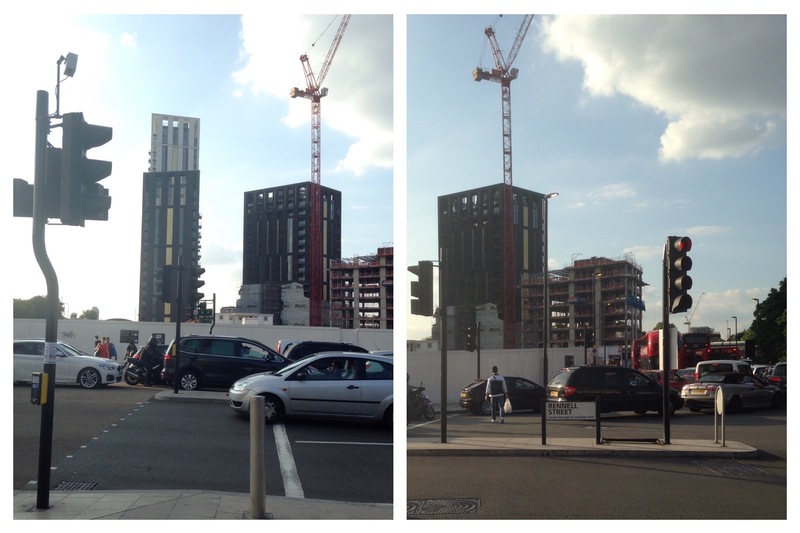 It remained until around the end of the first decade of the 21st century before it was demolished – part of the early preparation work for the redevelopment of the northern end of Lewisham town centre. Rennell Street still exists; it is part of a short stretch of dual carriageway to be endured by those passing through the town centre by road with risks of high levels of pollution. The final resting place of the pub is ‘marked’ by a pedestrian crossing (left, below) with its Victorian incarnation remembered via The Roebuck Memorial Traffic Lights (right, below). This entry was posted in Lewisham History and tagged Lewisham, Plough Green, Rennell Street, Roe Buck, Roe Buck (Lewisham), Roebuck, Roebuck (Lewisham), The Plough, The Plough (Lewisham) on June 1, 2017 by Paul B.